WEST LAFAYETTE, Ind. — The United Nations Development Program has chosen a Purdue University professor to lead an effort to reduce the risks and damage from earthquakes in Haiti. 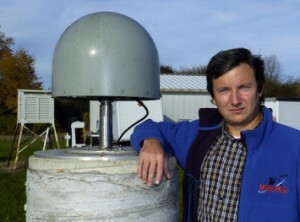 Eric Calais, a professor of earth and atmospheric sciences at Purdue University, is taking a leave of absence to serve a one-year term as science adviser for the United Nations Development Program, or UNDP, under its Disaster Risk Reduction Program in Haiti. Eric Calais, a professor of earth and atmospheric sciences, is taking a leave of absence to serve a one-year term as science adviser for the United Nations Development Program, or UNDP, under its Disaster Risk Reduction Program in Haiti. On Jan. 12 Haiti was struck by a magnitude 7 earthquake that caused massive destruction and killed more than 200,000 people. The disaster risk reduction program of UNDP will help set up a national agency for seismic risk reduction. As the chief technical adviser, Calais will assist the Haitian government in creating the agency and will help officials better understand the potential for earthquakes in the area, the risks involved and how to educate the population about related issues. Calais also will serve as the liaison to international partners such as the World Bank, European Union and Inter-American Development Bank. Calais has studied the Haitian faults since 1989, and his research team first reported the risk for a major earthquake there in 2008. By invitation from the Haitian government, he was one of the first scientists on the ground in Port-au-Prince after the January earthquake to investigate the cause and collect crucial data to assess the threat level for the area. Calais’ research team has studied the Enriquillo and Septentrional faults on the island of Hispaniola, which includes Haiti and the Dominican Republic, for five years using global positioning system technology. Earlier this month, the team announced preliminary findings that the January earthquake was caused by a previously unknown fault.